Are We Seeing The Beginning Of A 90% Fall In Stocks? We ended 2015 as yet another year when most investors felt safe with their stocks, bonds, property and other investments. But sentiment can change very quickly and since the year end the Chinese market is down 14%, the S&P down 6% and most global markets down 6-10%. Most investors had been hoping that the investment Shangri-La would continue for another year? Little do they realise that current values in no way reflects real values or risk. As we know, markets can remain irrational for a very long time. The risks that one day will bring the world economy down have been with us for quite a few years. 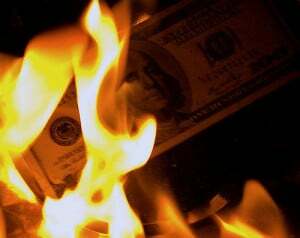 In 2007-9 world financial markets were on the verge of collapse but a Central Bank programme of money printing and guarantees amounting to $25 trillion kicked the can down the road yet another time. It is too early to tell if the very strong falls in world stock markets so far in 2016 are the beginning of the biggest bear market since 1929. But is is not unlikely that this is the start of a bear market which will see falls of up to 90% just like the Dow in 1929-32. Fundamentals today are considerably worse than at the beginning of the Great Depression. The world has seen an acceleration in credit creation since the Fed was founded in 1913 but the real acceleration started on 15 August 1971 when Nixon abandoned the gold backing of the dollar. The 1987 stock market crash and the property bubble in many Western countries in the early 1990s started the final phase of easy money, led by Alan Greenspan’s irresponsible monetary manipulations. But he was of course loved by politicians and investors since he created another investment bubble leading to the 2000 crash. With more easy money the world reached the next bubble and crisis in 2007-9. 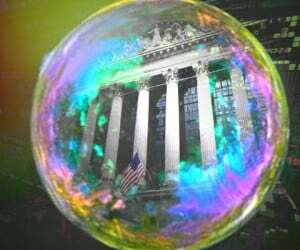 With the help of Bernanke who was the most productive person ever in American history we have now reached the super bubble era. Remember that Bernanke during his 8 years doubled US debt from $8 trillion to over $17 trillion. 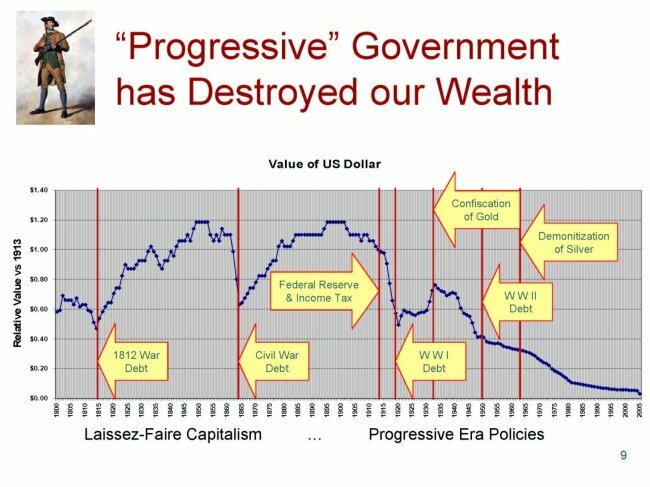 It took the US government over 100 years to go from zero to $6 trillion, a feat that Bernanke managed in a fraction (3/100th ) of the time. To be fair, it is not just US debt which has ballooned. Global debt in the mid-1990s was around $20 trillion and today it is $225 trillion. This is an incredible 10 times increase in world debt in 20 years. And just since 2008, global debt has increased by 50%. It should be clear to most observers that this exponential growth in credit will not have a good ending. The effect of the debt creation is to hide what is actually happening in the economy. Take for example workers’ wages in the US adjusted for real inflation. Today they are half the level they were in 1973. So the perceived improvement in living standards since then has been achieved by a massive increase in both personal and government debt. It is the same with real US GDP which is down 7% since 2006. John Williams of Shadow Government Statistics has produced an interesting study showing that real sales per share of S&P companies, adjusted for inflation and share buybacks, are down 30% since 2008. Thus the current boom in stocks does not rest on a sound foundation but rather on financial engineering. We are being misled by manufactured and manipulated information in a world of financial repression. It is of course possible to fool most of us most of the time, but at some point in the not too distant future, financial markets will tell us the truth. This will be when stocks and bonds crash together with most currencies, led by the dollar. The falls will be of equal magnitude to the credit creation we have seen in the last few decades including the derivative time bomb of $1.5 quadrillion. So we will see asset and credit markets losing 100s of trillions of dollars at a minimum in coming years. We are most probably looking at the end of a major economic cycle. Whether it is a 2000, 300 or a 100-year cycle, we will only know after the event. The magnitude of so many bubbles on a global basis certainly points to a very major cycle. There are many resemblances with the end of the Roman empire. The excesses and moral decadence we are now seeing in the world certainly point to the end of a major era. There is of course no way of telling if the turn in the cycle is going to happen in 2016 although this is not unlikely. The end of super cycles is very difficult to time exactly. However, what is absolutely clear is that the risks in the world are now greater than ever in history. I have discussed above the asset and credit bubbles. These bubbles are ubiquitous and present in Japan, China, most parts of Asia, Saudi Arabia and the Middle East, Russia, Europe, Brazil and many countries in South America as well as North America. The world has never before in history had a global bubble of this magnitude. We also have many political and geopolitical problems around the world. Most of the countries mentioned above will experience social unrest due to the coming economic downturn. The migration in Europe will also give rise to many problems. Another major risk is the potential of war and even nuclear war in the Middle East and also between the US and Russia. A conflict between the US and China in regard to the South China Sea is also a real possibility. The risk of a major conflict is now greater than at any time since WWII. The world is today a real minefield of economic and political risk and as one mine goes off, the likelihood of a massive global domino effect it substantial. As we don’t know when the first mine will detonate, we must take all the necessary precautions we can to be prepared for what could happen one day. I won’t go into all the preparations that everyone should think about in this article. Jim Sinclair recently published an excellent piece called “Be Prepared” on his website jsmineset. What is absolutely certain is that investors must now heed Mark Twain’s words: “I am more concerned about the return OF my money than the return ON my money”. As asset and credit bubbles implode, there will be the most enormous wealth destruction that the world has ever experienced. 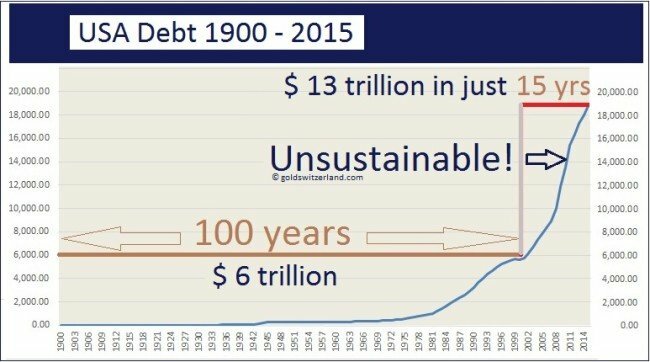 It will be the reverse of the massive growth in debt based assets that we have seen in the last hundred years. But the obliteration of wealth will be even greater due to the money printing that must central banks will undertake in the next few years in order to attempt to avert a global collapse. However, the money printing will have no beneficial effect but instead increase debt exponentially leading to hyperinflation and the total destruction of most currencies and the monetary system as we know it today. A deflationary implosion of the financial system will then follow. Most investors will not see this coming and won’t even consider the risk of it happening. In my view, it is not a question of if only of when. If you know that the risk of a fire is very high would you then not buy fire insurance? One thing is certain, you cannot buy fire insurance after the fire has started. Therefore, now is the time to insure against major risk. Throughout history gold has been the best insurance available in times of crisis. For 5000 years, gold has been the only money that has survived and maintained its purchasing power. Every single paper currency or quasi paper currency like the Roman Denarius has eventually reached its intrinsic value of ZERO. Gold has been the only stable money throughout history. 2000 years ago an ounce of gold bought a good suit for a man just like it does today. In order to insure wealth against the current unprecedented risks in the world, investors should own an important amount of physical gold and store it outside the banking system. Without doubt, this will prove to be the best insurance against the coming wealth destruction. Gold is today as unloved and undervalued as it was at the beginning of the 2000s at around $300 per ounce. The four year correction has probably ended. At around $1,100 gold will be the best insurance cover that investors can ever buy.